Spring is around the corner, birds are singing, flowers blooming, and leaves are out. Is your backyard ready for the arrival of wild birds? Would you like to teach your kids about wildlife? Why not make backyard bird watching a family project. Backyard bird watching is a great outdoor activity for kids. 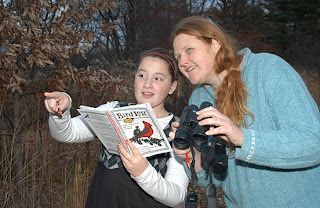 Bird watching is convenient way to connect kids with science and teach them about wildlife. Many bird watchers say they first became connected with birds and nature because someone took the time to watch birds with them. In my case, I have fond memories of my grandfather making bird feeders and placing them on our hybrid orange tree so we could watch the birds eat from the kitchen. You see is just that sharing your love and enthusiasm for birds with your child just as my grandfather did to me can open their eyes and lead them to a lifelong interest in birds and the outdoors. Unfortunately, many birds are losing their natural habitats to urban development so it’s critical that we increase their chances of survival. By placing bird feeders in our backyard, we allow nesting birds to spend more time guarding their nest instead of foraging for food. Here are some tips from Bill Thompson, III editor of Bird Watcher's Digest so you can help your child turn your yard into a bird sanctuary. Remember Mother Nature will send the birds to you entirely for free! · Give your seed feeders (especially thistle and tube feeders) a shake before you refill them, to dislodge any compacted seed. Dump out any wet clumps of old seed. · Clean all hulls off platform feeders and out of seed trays daily. · Keep some old spatulas and brushes handy by the feeding station for cleaning purposes. · Disinfect feeders by scrubbing with a weak bleach solution (1/4 cup of bleach to 2 gallons of warm water) every few weeks, more often in summer or rainy periods. Rinse and allow feeders to dry before refilling. · Wash your hands thoroughly after filling or cleaning your feeders. · Move your feeding station when the ground beneath it becomes covered with seed hulls and droppings. Rake the old site to remove hulls and to give the grass a chance to recover. · Store your seed in a clean, dry, air-tight container, such as a metal or plastic garbage can. · Don't allow large amounts of seed to become wet, as on platform feeders. Instead, when it's wet outside, feed primarily from covered feeders that will keep seed dry or put out only a handful of seed at a time on platforms. · Don't put hulled sunflower hearts (or bits) out where wet weather can cause them to spoil. Offer them in a tube or hopper feeder. · Don't put out any more seed than can be eaten by the birds by nightfall, especially where raccoons, opossums, bears, deer, or rodents are a problem. · If you see a sick or dead bird at your feeders, halt your feeding for a few weeks to allow the healthy birds to disperse. This lessens the possibility of disease transmission. Remove and discard in the trash any dead birds. Report the sick birds to your local wildlife officials, many of whom monitor wildlife health. · If you provide suet, reduce the amount you offer in hot weather. Heat can make suet rancid and unhealthy for birds. Runny suet can also stick to birds' feathers, making them hard to keep clean and useful. Use rendered suet or heat-resilient suet blocks that are available commercially. · Reduce window-kills of birds by placing feeders a safe distance away. If birds regularly strike a particular window place a screen, crop netting, or a series of branches over or in front of the outside glass panel to break up the reflection. · Though birds may not be entirely dependent on your feeder, it's best not to leave them totally without food if you plan to be away from home in midwinter. Purchase an oversized feeder with a large seed capacity or ask a willing neighbor to continue feeding your birds. · Don't discontinue feeding as soon as the grass greens and the weather warms in spring. Many birds will continue coming to your feeders all summer long. · Don't use grease, oil, petroleum jelly, or similar substances on your feeder poles or wires to thwart squirrels, ants, or other feeder-raiding creatures. If these substances come into contact with bird feathers they are impossible for the bird to preen or wash out. Gooey feathers can become useless for flight or insulation, thus putting the birds at risk to predators, extreme weather, and disease. For squirrels and other mammals, use a pole-mounted baffle (many are sold commercially). For ants, use an ant guard that prevents ants from reaching the feeder. Both baffles and ant guards are available on the Internet, by mail-order, or in retail stores that sell an extensive array of backyard products. · Black-oil sunflower seed is the most widely used birdseed, popular with the greatest number of bird species. Its thin shell and large nutmeat are ideal for most feeder species. 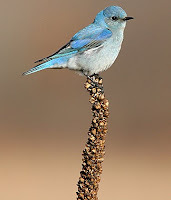 · Offer a variety of seeds and food in a variety of appropriate feeders (sunflower seed in tube, hopper, or platform feeders, thistle in tube feeders, peanuts in peanut feeders, suet in suet cages, and mixed seed on platform feeders or scattered on dry ground). · Offer the thick-shelled gray-striped sunflower seed to cardinals, grosbeaks, jays, chickadees, titmice, and nuthatches. · Offer safflower seed to cardinals. Squirrels and blackbirds in many parts of the continent do not like it. · If your feeder is overrun with blackbirds, pigeons, or house sparrows, stop offering mixed seed on the ground or on platform feeders. Feed only black-oil sunflower seed in tube or hopper feeders until the problem species disperse. · Don't offer so-called wild bird mixes in tube feeders. These are better fed on platforms or out of hopper feeders. Birds that prefer sunflower seed will just empty the feeder to get at the sunflower seeds. · Make a brushpile near your feeder to make sparrows, towhees, and other shy birds feel more at home, but be sure it won't harbor roaming cats. 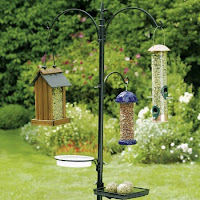 · Add natural features to your feeding station, such as branches to perch on, to make birds feel more at ease. · Don't use hummingbird feeders that are difficult to clean, or have many small parts. · Do wash your hummingbird feeders thoroughly with hot, soapy water and rinse completely every time you refill them. · Don't allow molds or yeasts to grow in your hummingbird feeders. When these appear, empty and scrub feeders immediately. · When making hummingbird nectar, blend water and white table sugar in a 4 to 1 ratio (4 parts water to 1 part sugar). Add the sugar to boiling water. Bring the mixture to a boil again while stirring to dissolve the sugar, then let cool. · Don't use insecticides, such as wasp killers, anywhere near bird feeders, especially hummingbird feeders. · Don't use anything but white, granulated table sugar. No powdered or brown sugar, honey, molasses, red-food coloring, artificial sweeteners or nutrients should be used. Don't situate birdbaths under feeders or perches where droppings can fall into them. Rinse and scrub birdbaths daily in summer, or whenever they become fouled with bird droppings. Once a month, scrub out with a light bleach solution (1/4 cup of bleach in 2 gallons of water), rinse thoroughly, and refill. Project Feeder Watch is a winter-long survey of birds that visit feeders at backyards, nature centers, community areas, and other locales in North America. Feeder Watchers periodically count the birds they see at their feeders from November through early April and send their counts to Project Feeder Watch. Feeder Watch data help scientists track broad scale movements of winter bird populations and long-term trends in bird distribution and abundance. 1. Download a free PDF of the Homeschooler's Guide to Project FeederWatch. 3. Birds Printables - Birds Wordsearch. Print the Birds Word Search and find the Birds related words. Using the book, "The Magpies' Nest," this lesson teaches how birds build nests and allows students to build their own nests. What Is Adaptation? Compare and contrast human and animal adaptations. Why Are Feathers Special? -- Activity 4.2 Use a lesson that shows why feathers are a remarkable example of animal adaptation. What Purposes Can Feathers Serve? -- Activity 4.3 Children learn how animals adapt to cold environments with the help of their feathers. Can You Make a Feather? -- Activity 4.4 Children will construct their own feather and compare it with a real bird feather. How Is Color Used by Living Things? -- Activity 4.5 This small group activity teaches students the important role color plays in animal adaptation. How Do Birds Adapt to Eating? -- Activity 4.6 In this hands-on lesson, children learn how birds have adapted their beaks in order to successfully eat. What Are Some Other Eating Adaptations? -- Activity 4.7 Your child classify animals according to their mouth shape and parts, as well as the foods they eat. What Are Human Teeth Like? -- Activity 4.8 Human teeth are compared with animal teeth to teach children about this specific adaptation. How Do Animals Move? -- Activity 4.9 In this activity younger children can imitate animal movements, while older students can play animal movement charades. How Do Some Animals Communicate? -- Activity 4.10 In small groups, students make only movements while describing a certain object. How Do Seasons Affect Animal Adaptations? -- Activity 4.11 Animals have different ways of adapting to seasonal change. In this lesson students will classify animals into three categories of adaptation: hibernate, migrate, and adapt. How Do Animals Adapt to Seasonal Change? -- Activity 4.12 Present an activity that uses globes to show that some birds migrate east and west rather than north and south. Can You Design a Better Bird? -- Activity 4.13 Children design a bird using a variety of materials. This lesson is a great culminating activity on Animal Adaptation. Explore Activity: Exploring Feeding Adaptations Students make a mouth model to explore the feeding adaptations of different animals. Materials list, advance preparation instructions, lab hints and tips, safety tips, rubric, worksheets, and answer key are provided. Explore Activity: Exploring Protective Coloring Students explore how a moth's coloring protects it from being seen in its habitat. Materials list, rubric, worksheets, and answer key are provided. Adaptations: Family Activity Suggest a family activity to parents that focuses on how living thing adapt for survival, and on vocabulary words related to adaptation. Changing and Adapting: Family Activity Suggest a family activity to parents that includes home projects and vocabulary words related to change and adaptation.